I’ve always been one and never realized it, until I received a rejection letter some time ago that caused me to ponder it, and then later believe it – fully. That’s enough set-up suspense. I’m referring to the fact that I am a contrarian. Reflection on it began when a Houston publisher sent me a very nice rejection letter on a manuscript I’d queried him on. He complimented the writing, the structure and the style and then dropped a bomb. He didn’t think it would sell. That began a rampant flow of analytical juices flowing through my brain. I’ve always been told to write what I know. I’ve been doing that, and did on that particular manuscript. But, if it won’t sell, what’s the point – personal satisfaction? Here’s where my drummer and I split from the parade and head out alone; you know, that different drummer we always hear about. When I first began writing novels, working with subjects I had knowledge of never crossed my mind as an intelligent choice. It just came naturally to do it that way, but for a totally different reason than you might imagine. It was a conscious choice to not write another murder, military, detective, cop, espionage, or medical thriller. There are many fine authors that are all over those genres and, at any given time, half or more are on the New York Times Best Seller List. Smart money said do it. But, I had to be the contrarian and take my chances in less plowed fields. Once I figured out that that choice would likely keep me on the verge of destitution, it became clear that I’ve always had a penchant for going against the norm. That rejection, for that reason, was not an isolated case. Here’s how I view it: If everyone is cheering one team, I root for the other. If market advisers say a stock is the buy of the century, I’m looking at a little known competitor. At a party, when all the guys buzz around a blond model in the center of the room like green flies on a manure heap, I drift to the girl standing alone and appearing amazed by the pattern on the wallpaper. I could go on but I think you get the point. So, you see, this behavior is nothing new. It’s just that, now, I realize it. I have risked much opposing popular views – sometimes for no good reason. Still, I’ve come to believe it’s not what I am but who I am, cast in that proverbial stone. I realize that if I would have chosen to go along with popular beliefs more frequently, I might be driving a luxury car and living in an expensive loft somewhere. I suppose though, if I’m going to be a contrarian, I might as well be the best one I can be. A lifelong Texan, Daniel (Danny) Lance Wright is a freelance writer and novelist residing in Clifton, Texas with Rickie, his wife of 42 years. Wright spent the first nineteen years of his life on a cotton farm on the South Plains and the next thirty-two in the television industry. Girl Who Reads is an Amazon advertising affiliate; a small fee is earned when purchases are made at Amazon through the link above. The opinions, beliefs, and views expressed by guest writers are their own and do not necessarily reflect those of Girl Who Reads. Nice reminder of the importance of following one's heart - and being a contrarian if that's where it leads you! 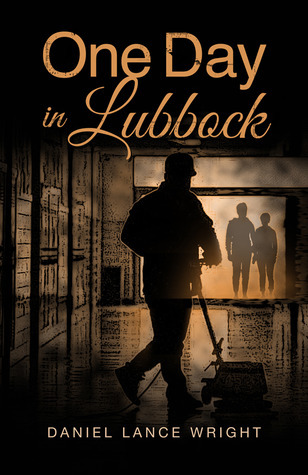 Looking forward to reading One Day in Lubbock, Daniel.